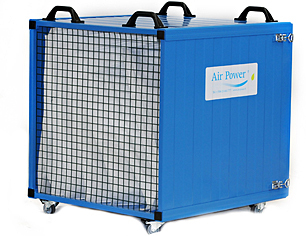 AirPower S2001 has been developed for filtering the exhaust air in air duct cleaning. The particles loosened by AirPower brushing device and transferred by AirPower A2001 blower are caught in the filter unit. 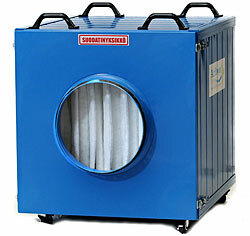 After the thorough filtering the air can be led back indoors. Thanks to the rotating wheels and to its light weight, AIR POWER S2001 is easy to move around also in difficult conditions. Standard connection assures an easy use in different environments. AirPower S2001 is capable for filtering 5000 m³/h. If more capacity is required, two or more filter units can be installed parallel with each other. AirPower hose package makes an easy connection of AirPower S2001 filter unit to standard size air ducts and AirPower A2001 vacuum maker possible. The package includes Ø 250 mm and Ø 300 mm hoses and adapters.